There has in recent years been considerable focus in terms of operations in Afghanistan. 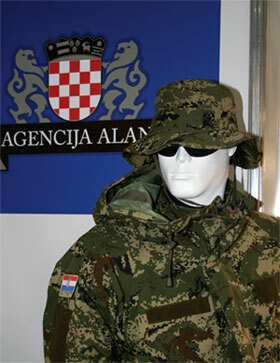 For local communications in that theatre, Croatia has previously used the Motorola GP300 for troops' personal radios. The requirement for personal radios is currently being finalised with a procurement potentially beginning in the next two years. In common with a number of militaries in Eastern Europe, while C4I is on the backburner small arms have taken centre stage. Croatia selected the domestically produced VHS (Višenamjenska Hrvatska Strojnica) or Multifunctional Croatian Machine gun for its 5.56x45mm assault rifle requirements. The first 1000 rifles are split rough 70:30 between the standard VHS-D and the K model short barrel carbine. A total of 16,000 weapons may be ultimately acquired. The VHS is part of a family of weapons, designed to replace Warsaw Pact era weapons. The first replacement solution was the HS2000 (Hrvatski Samokres) or Croatian Pistol 2000 pistol, which had already been developed at the point at which the decision to proceed with the weapons family was made.